My wife wanted a print of the cartoon. It's always odd - but pleasantly so - when two of your daily reading habits collide like this. 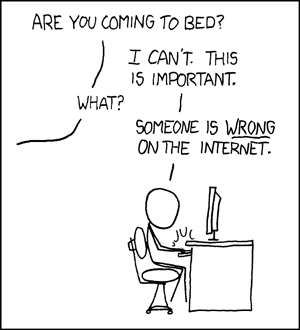 (Ok, xkcd isn't daily, but whatever). If you start writing about baseball, I'll get nervous. Writing about baseball? You can rest easy on that score. Thought so. But all the same, I didn't really expect xkcd to pop up here. He should sell T-shirts with that on.